There will likely be some mind-blowing revelations coming from an audit of the Federal Reserve. Democrats in Congress and Barack Hussein have fought such an audit for years. That alone is evidence that the revelations will be mind-blowing, and probably frightening. Finally, it is going to happen! 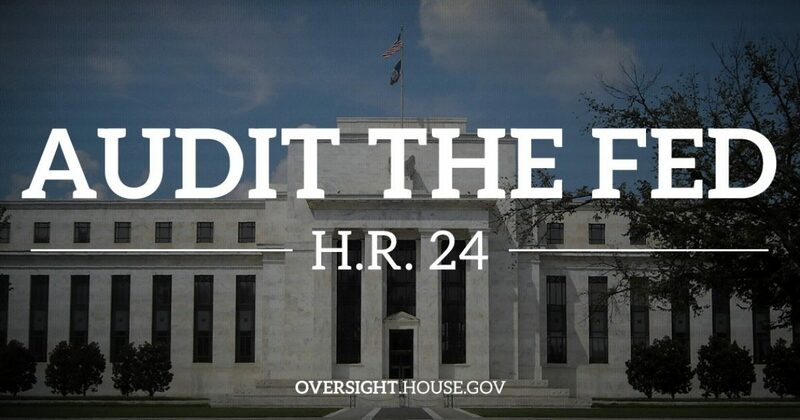 Jason Chaffetz and his House Committee on Oversight and Government Reform approved H.R.24 after a brief debate. A House panel on Tuesday approved legislation that would let a government watchdog audit the Federal Reserve’s monetary policy decisions, a move bitterly opposed by the central bank, according to Market Watch. The House Committee on oversight and government reform passed the measure by voice vote after roughly 30 minutes of debate. Analysts said the measure has a better chance to become law now that Republicans control both houses of Congress and the White House. Paul’s son, Rand, the Republican senator from Kentucky, has introduced a similar measure in the Senate. Democrats in the committee were firmly against the bill. “This bill would open the floodgates to political interference in monetary-policy making,” said Del. Eleanor Holmes Norton, a Democrat from the District of Columbia. Rep. Carolyn Maloney, a Democrat from New York, said the measure would lead to higher interest rates because it would undermine the market’s confidence in the independence of the central bank. Republicans said the measure was needed to rein in the Fed. “It is ironic that the arsonists that caused the financial collapse are now being given credit…for putting out the fire. Almost every macroeconomist concedes in retrospect that [the Fed’s] extended period of easy money led to the financial crisis,” said Rep. Thomas Massie, a Republican from Kentucky.